Did you know that Madrid is the highest capital city in Europe? Neither did we. 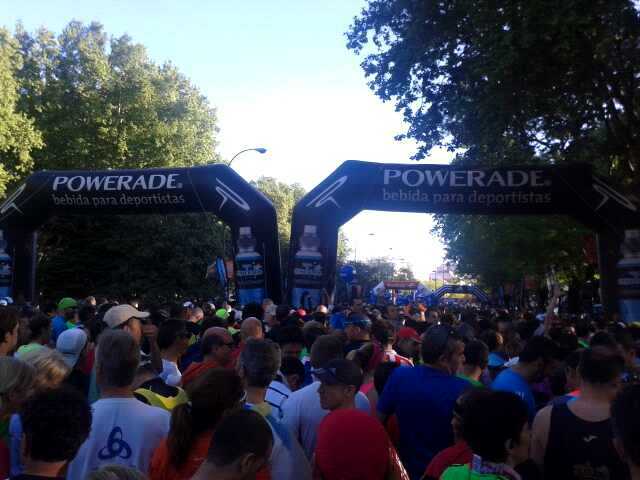 The up and down Rock ‘n’ Roll Madrid half marathon course, 700 metres above sea level, was 21.1 km of undulating uncertainty and for Ro, a first time experience of having ‘to go’ on the run. Having succumbed to clever marketing and the promise of a big shiny medal, this was our first taste of the Rock ‘n’ Roll Marathon Series and Dano’s first European half marathon. The Expo was held in a hall just over the river from central Madrid and had a really good range of exhibitors such as Brooks Running, TomTom, New Balance and an impressive display by Adidas, the race sponsor. We also enjoyed the opportunity to dress up like glam rock stars and have a photo taken by a extroverted, mohawked American race employee, in front of the RnR Madrid poster. Race morning prep consisted of fuelling with a SiS GO Electrolyte drink, a piece of chocolate cake and a banana after which, we made our way to Banco de España metro station to head to the bag drop prior to the 9 am race start. Dano got quite a warm-up running with our bag into the park to locate the bag drop then back to where I was waiting for him. We made it into the corrals at 8.55 am. See each of our race reports below. Standing on the start line in Parque del Retiro I felt a mixture of emotions; gutted I had not signed up to the full marathon but at the same time quite relieved I was doing the half as Liverpool were playing Chelsea just after lunch. As usual the starting area was quite hectic with people jostling to find their corral. There must have been over 100 runners trying to squeeze into my corral, no. 2, and only one steward checking bibs. Inside the corral, probably only several hundred yards from the start line, it felt quite packed which was frustrating. There was good support at the start line, with rock music and an MC. Before I knew it I was ascending the gradual incline we had seen on the course map. Not looking to push too hard up it, finding my pace was impossible due to the sheer volume of runners. I was stuck in traffic all the way up the first 5 km. I could quite clearly tell that there were numerous runners who should not have started from the front corrals, bobbing along and getting in the way of runners like myself who were faster and had a race strategy. Something I hope Rock ‘n’ Roll Madrid will address before next year. Several kilometres in, and with the roads still seemingly too narrow for the amount of runners, I was gradually finding my pace however, with the early part of the race being stop-start, a PB was now possibly out of the reckoning. A sunny day, which got increasingly warmer and a course which was turning out to be tougher than expected, I was quite pleased to be doing the half and not the full. Crowd support and entertainment was also quite sparse with some roads being completely void of anyone other than one man and his pero. As with most races, scenery on the course can sometimes pass you by and take second stage. However, with making an effort to look and take this course in it did not have much, in my opinion, to look at. The passing of the iconic Santiago Bernabeu (Real Madrid FC stadium) early in the race was a highlight. The half marathoners and marathoners split up between 13 and 14 km and as the groups split, a mixed feeling of relief and that I should be with them came over me. Onwards and again upwards and downwards, the course continued to surprise. With some good downhill roads during the latter stages, the odd hilly road did arise and really sapped my energy levels. Water stations were standard with bananas and energy drinks supplied further into the race. One water station was pitched in the middle of the road so runners were able to grab drinks from either side resulting in bottles being disposed of all over the place. 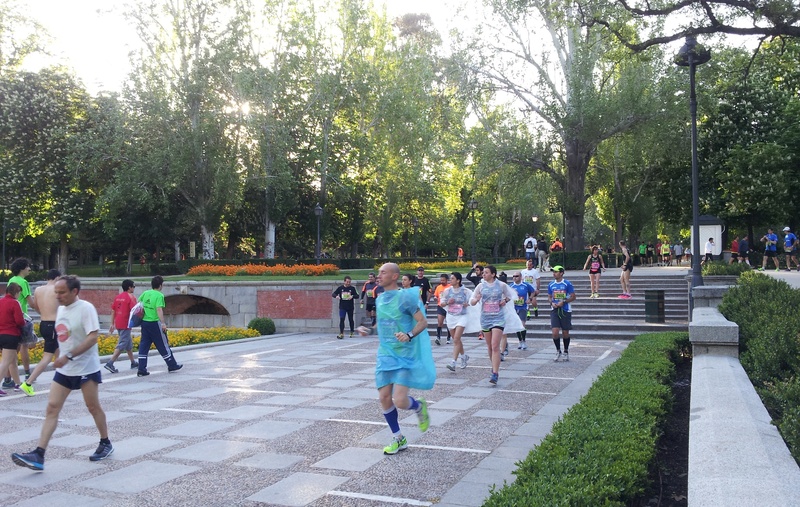 Approaching 19 km and the finish line in Parque del Retiro I was on target for my first sub 1:40 half marathon. The road was pretty much flat and I was feeling tired but strong enough to nail it. This changed however the minute I turned the last corner and did the final approach to the finish line. A 2 km incline was ahead and bang went my chance of my PB. I had run hard throughout the race, up and down hilly roads in the quest for a sub 1:40 and with that last hill, it all went up in smoke. To put an incline like that at the end of the race is, in my opinion, stupid. Why could the race not finish off on the straight stretch? It was tough for the half marathoners so can only imagine the pain for the full marathoners. Running, what felt like backwards and in slow motion up the hill, the support finally increased. Approaching the line, with several sponsored inflatable arches, the finish line was lost to me. Eventually crossing the finish line in 1:41 I was quite annoyed and frustrated. So many things throughout the race were, in my opinion, not the best. Too many unregistered runners, runners in the wrong corral at the start, lack of support, sporadic entertainment and a dull course. I may return to Madrid one day but it will be to watch the footy and not run I’m afraid. To finish Rock ‘n’ Roll Madrid half marathon just 22 seconds off my PB (achieved on a flat course in Amsterdam) was, upon reflection as I chowed down on a meaty post-race pizza in Parque del Retiro, a decent achievement. I had three things against me on the day; lack of training (I’ve never followed a training plan from start to finish although I really want to be that dedicated), hills, and the dreaded runners trots (the first and hopefully the last). The RnR Madrid course started with an approximate 6 km gentle incline which seemed like it would never end. I had calculated pre-race that I would aim for an average pace of 6.29 mins/km in the optimistic hope of achieving 2:15. Running the first 6 km, if I dipped slightly below this pace I planned to make up the time on the downhill. Kilometres 6 – 8 were relatively flat followed by a welcome downhill/flat section between kilometres 8 – 14. Along the course I dipped in and out of shade when possible as the mid-morning madrileño sun warmed up. Pre-empting the sunshine I was running for the first time wearing a Nike Dri Fit Brake Run cap which was super comfy and kept the sun out of my eyes. I took my first gel (SiS GO Isotonic) at 8 km and over the next kilometre the need to stop for a toilet break and the urgency increased. At first I thought it may be my imagination and unnecessary panic but by 9 km, by which point I hadn’t seen any portaloos along the route, I stopped and asked a policeman “¿donde estan los baños?” to which he responded “bar or restaurant”. Not long after it was touch and go like I’ve never experienced before. The FEAR! I was lucky enough to run by a Salon de Juegos (a high street casino) on Calle de Bravo Murillo. I ran in and quickly asked if there was a toilet, received a key from the cashier and ran to the back, past one punter, and up and down some stairs to a locked door with which I struggled to unlock for about a minute. Crisis averted but 5 minutes lost. Running through the salon de juegos and onto the street again I was flying downhill. I felt energised and really wanted to make up some ground. Between 10 – 20 km I overtook 100 women but slipped back half of that on the ascent to the finish line. At 16 km I spotted @tartanjogger and her husband 200-300 metres ahead but was unable to catch up and say hello until we had crossed the finish line. I also took my second and last gel at this point. I remember taking a right corner, probably at about 18 km, and seeing a huge hill. Not what I needed to see at this point. I slowly crawled up it knowing that if the toilet stop hadn’t damaged my chance of a PB then this hill would. At this point I decided it was just a case of finishing rather than achieving a PB. The hill went on for 1 km and although 20 – 21 km was still uphill it was not as steep. I found myself stopping for a few seconds at a time then continuing. The gates of Parque del Retiro, where the finish line was, was a welcome sight and I battled on through the park surrounded by supporters along either side. I spotted Dano waving, having finished the half about 45 minutes earlier. I picked up the pace for the last 100 metres and crossed the line so happy for it to be over. For my next half marathon, later this month, I will be watching what I eat the night before, fine tuning my pre-race fuelling and avoiding bananas on race day morning. Awesome medal; bright, gaudy and chunky like Pat Butcher. Lovely finishing area, in Parque del Retiro. Nice weather but make sure to wear some sunnies or a cap. Undulating and finishing uphill. Not a race for a PB. No portaloos along the course. Bag drop location quite far into the park, with the start line outside the park. Many unregistered runners sneaking in to participate (Dano even saw one being stripped of his medal when volunteers realised he was wearing last year’s race no.) and slower runners starting in the top corrals. Sparse support along a lot of the course. Despite the above, we would recommend the course at least once as Madrid is a nice city to visit and the achievement of finishing the course, given a 7/10 rating for difficulty, was worth it. Congratulations to you both! I love the RnR medals, they are always so fun and gaudy! Great recap! It’s so cool to see other people’s perspective on the same race–we had similar thoughts on this one! Thanks! Yes, it is good to compare experiences. Def. agree on the bag drop!